As our help center as well as the comment-edit-field placeholder text both explain, comments are not meant to be used to post potential answers, to chat (we've got chatrooms for that), or to discuss things endlessly. Comments are only meant to be used for clarification and/or to suggest enhancements to the related question or answer. To keep the noise down, things have been moved to chat. The question becomes empty and appears abandoned, with only a moderator comment stating the comments have been removed and were not in accordance with "site policy". Relevant, non-chatty comments are also removed and cannot be seen without going to the chat room, i.e. most users won't see them when viewing the question. All discussions die down, since no one ever uses the chat room. Potential answers posted as comments are no longer visible. The feeling of not being welcome on this site is further strengthened as moderators "correct" other users for their behavior and point out their "mistakes". This means users will be less motivated in the future to post comments which may be helpful, but are not "according to the rules". Furthermore, I think the arguments above for moving the comments to chat are not very strong. For instance, in this related question I do not see anyone suggesting that answers posted as comments should be removed - these are often from people who have an idea how to answer the question, but do not have time to post a full answer. Removing their comments motivates them not to put in any effort at all next time. Also "keeping the noise" down seems hardly an issue, since Crypto.SE is not that active compared to other sites, and if for instance I go to the top answer at the top StackOverflow question, I see there are 64 comments on that answer. So I wouldn't say 5-10 comments is necessarily "too much noise". Anyway, I think I've made my opinion clear, but I would like to know: What is your opinion on this? What do you think about when moderators should move comments to the chat room? Is the quoted policy the right policy, or should moderators use more "moderation" in deciding when to move comments to chat? … and if for instance I go to the top answer at the top StackOverflow question, I see there are 64 comments on that answer. StackOverflow is one of the many sites of the StackExchange network. All sites work according to their own rules! Meaning: what may be on-topic at one site, may very well be off-topic at another. This – among other things – becomes apparent when you check the individual help centers and individual close reasons each site provides and uses. So I wouldn't say 5-10 comments is necessarily "too much noise". Generally, that number indeed doesn’t sound like much noise. Yet, it should also be noted that after 5 comments, all following comments are hidden behind a system message… therefore it sometimes sure makes sense to separate the noise from the usable comments. The question is rather broad, and more than a truckload of answers are possible. YOU post a line about your personal opinion related to Shor et al. Problem is: the commented question itself is rather broad and a bit unclear when it comes to what is being asked (we have a pretty alike Q already – dupe?) and therefore it opens the doors to a truckload of short comments/hints. Actually, due to the broadness of this particular Q, the hints in the comments practically transformed into "potential answers" and could actually have been posted as answers as well… as said: in this particular case. Other questions are different, and there it makes more sense to leave hints as-is. In this particular case, it made more sense to wrap up the comments in a community wiki answer – which MaartenBodewes created and I added the commented hints into, putting the usuable hints/comments in focus. Long story short: in this particular case the noise was moved to chat, while the hints were merged into the community wiki answer. Nothing was deleted. The extended notice I added to the "comments were moved to chat" link (not visible in above screenshot) was merely a general reminder; like a heads-up. Nothing more, nothing less. It was not meant to target any specific user or comment, but more of a "just be sure to remember…" as some comments to that particular Q quickly rendered themselves "obsolete"while others started bordering "too chatty". 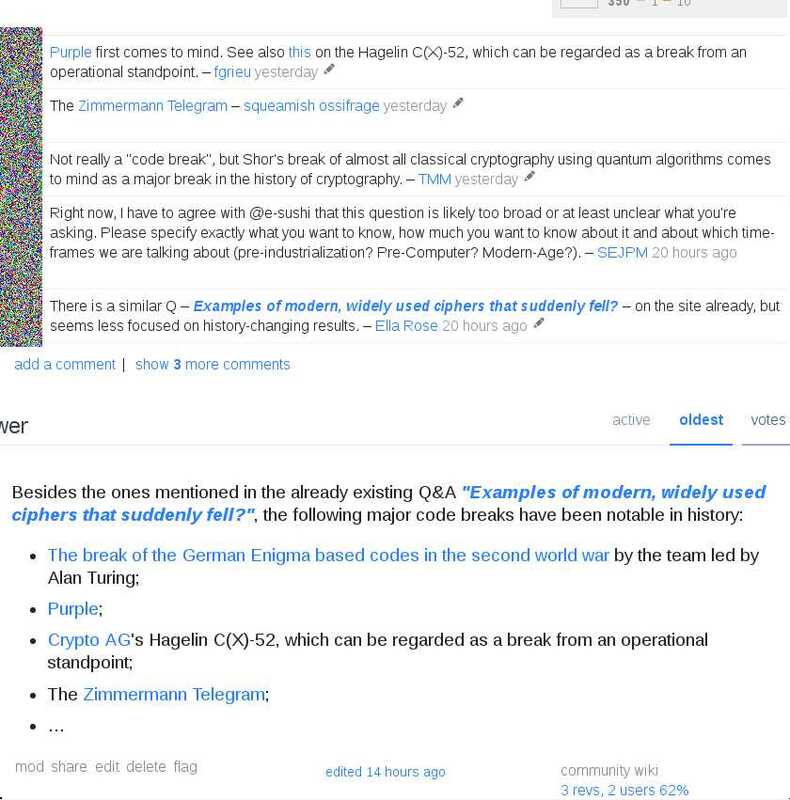 A few hours later, the OP of that question edited his Q to clarify his/her "research efforts" by listing all hints at potential answers which were mentioned in the comments and (in consequence) the created community wiki answer. Hints or pointers are welcome nevertheless! Generally, providing hints or short pointers as a "heads-up" in comments surely tends to be welcome (just think of all the helpfull hints when homework-alike Qs are posted) – which is why we moderators tend to leave most comments alone. We only clean up stuff or enhance things when it makes sense. For example: if comments resolved something and thereby rendered themselves "obsolete", or if they mutated in a "too chatty" back-and-forth. The reason to sometimes "clean up" some comments is pretty simple: sometimes, "comments aside" tend to hide very usefull hints and information between some chit-chat. When that happens, it definitely makes sense to move some stuff to chat… as that puts the usefull hints and informational comments back into the focus they deserve. Let’s be honest – no one will scroll through 10+ comments just to see if there’s a valuable hint hidden between some noise… where "noise" can be anything ranging from "funny note aside" to "full discussions". The means chosen to optimize comments in such cases can be very different: "move to chat", merge two or more comments by same user into one comment", etc. If comments are cleaned/optimized, the goal is to put focus back on what is being asked as well as all the valuable information posted as comment and/or answer. Sometimes flags point us moderators to such things, sometimes we happen to stumble upon such situations ourselves. If it makes sense, we try to make things better. Having said all the above, there’s this fine line between "a hint" and "an answer" we haven’t talked about yet. See, we frequently have situations where someone asks something, a comment answers what is being asked and OP is happy enough to abandon the Q. Most of the time, such Qs end up "unanswered" from the SE system point of view. That’s something to keep in mind, the reason why I added the heads-up notice to the chat link, and something we all need to watch out for. Good SE sites have questions with (accepted) answers, not comment-answers. I think that somewhat wraps things up. Always feel invited to use comments to ask for clarification, to hint at something, or to give a heads-up. Yet, always ask yourself it what you’re posting isn’t actually an answer. If, please consider about posting it as such. You might even gain some reputation points when you do. To make sure it doesn't appear empty/abandoned, I'd suggest instead leaving a +1 (at least) or an answer if possible. Others have addressed this, but I'll add that relevant comments should be edited into the question/answer they are on. For example, if I ask a question and you ask me a clarifying question in a comment, and I answer it in a comment, you should feel very welcome to edit the question the the necessary details. Then the comments can be deleted, as would be very appropriate at that point. So start using the chat room! I've had chats with users on this site in these special rooms that have lasted anywhere from a few minutes to a few days. We then try to update the question/answer accordingly. Then post it as an answer. Even if it was someone else's answer. Post it. Then you get the points. If it was someone else's and you feel bad about that, then mark it "community wiki". I'm not sure I follow. Are you saying that if, for example, I see two users going back and forth on the comments for 10-15 or more comments and I move them to chat, that these users will feel unwelcome and discouraged from posting comments in the future? Is the quoted policy the right policy, or should moderators use more "moderation" in deciding when to move comments to chat? I actually really like this policy. I think we should also do more of this and more encouraging of editing questions/answers so that we can remove more comments. I hate it on other sites when I read a question, read the answer, try it out and it doesn't work, then have to read 20-30 comments about why the answer didn't work because I didn't have a particular package installed or the browser version is newer, etc. If the resolution discussed in the comments had been edited into the answer, it would have saved me a lot of time. Note: This post doesn't follow any particular structure. Actually I'd have to argue the opposite: Any number of comments that makes me click the "show more comments" button is "too much" for me, this usually happens around 5 comments. After all the idea of comments is indeed to be temporary and ask for clarification. Anything else I'd consider a "nice ressource for potential answers" which should be mainly interesting for the interested answerer. After all we're here for "Questions and Answers" and not "Questions and Comments". If they're relevant and non-chatty you should go ahead and collect them to form an answer, I'd suggest? At this point their usefulness will be "historic" at most and they can be of "historic value" in chat just as well as in the comment section. While it is true that most people don't bother with the specialised chat rooms, the generality of this statement is false as a) our main chat sees quite some activity from time to time and b) there are situations in which the OP is an experienced SE user and ready to provide a lot of information with a "one-time value" (eg mainly for answers) in a short period of time for which chat is fully optimized. And again, comments are not supposed to answer questions and as such they become a useful tools for answerers at best if they don't ask for clarification. They're only one click away, which doesn't sound like "no longer visible" to me. Well, a) the comments are actually not in accordance with site policy and b) no immediately visible activity does mean that a question is abandoned at all, as many users have notifications enabled and may even check into SE daily and as such would react fast even if the post has seen no activity in a long time. Removing their comments motivates them not to put in any effort at all next time. Actually, seeing a bunch of comments removed and a chat-notice left is a good sign that there's material for an easy answer by any of the participants or an outsider. Again, nothing is removed, things are just cleaned up and relocated. I have to admit, not to have enough data / experience with this on a personally-affected" level to be able to judge whether it would scare me away, especially not in the time-span where I was less experienced with SE. Clean the questions up, concentrate ressources and stick to the clear purposes of your tools. What do you think about when moderators should move comments to the chat room? They should be moved when there's a significant number of non-requesting comments. I define significant to be at the discretion of the people with this power and and probably be in the range startin at 5 and being more pressing at 10. They already do and up until now I don't see how they should be less "aggressive" in using this tool. I see there are 64 comments on that answer. StackOverflow may handle this issue differently than we are, especially since random bypassers at SO are much more common or it may be the case that all those comments are too new to have been moved by a mod because they've much much much more to do there than here, where they do indeed have time to inspect every question with recent activity. I'll answer specifically the "potential answers in comments" one. Answering in comments prevents people from indicating the answer is good or bad by up/down voting, and from improving it by editing it. This is why it is theoretically forbidden in all stacks. In practise, some stacks are much rigorous in enforcing this than others (rpg:se is particularly fierce - the mods there delete such comments on sight). If you have a "potential answer" but not enough time for a full answer, answer the question and mark it as a community wiki. The rep cost/benefit is the same as a comment, but now the community can improve the answer and vote on it. Not the answer you're looking for? Browse other questions tagged discussion moderation comments reputation . Why do we remove “Thanks in advance” from questions? What should be the room description of “the Side Channel”?